The Optilab PNL-1064 is a programmable laser that produces nanosecond pulses with electrical input pulses. It functions as a seed pulse generator for Master Oscillator Power Amplifiers (MOPA). 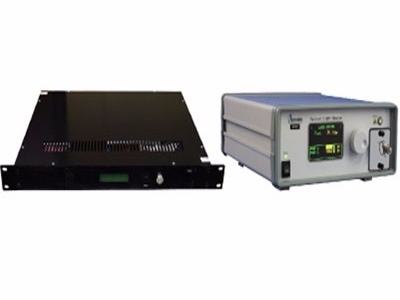 Available in a rackmount or benchtop unit, the PNL-1064 also functions as electrical to optical pulse generator. It consists of a narrow-line-width, ultra stable, high power DFB laser diode for gain switch, direct modulation to provide pure and efficient modulation. The PNL-1064 is available with SM or PM fiber, and is designed for direct modulation of laser current to pulse modulation to produce < 5 ns width optical pulses using an electrical input from an external pulse generator, and the peak output power can reach 500 mW. The laser system is equipped with a standard remote control interface (RS-232) and an LCD display screen for easy user interface, accessible through a front panel adjustment knob. Contact Optilab for more information. LDC display or RS-232 for Laser Switch, EDFA output power through front panel.